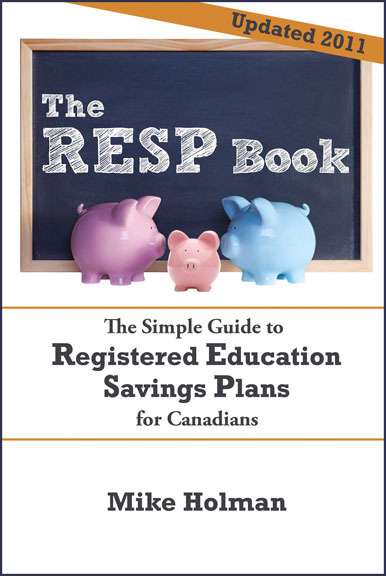 I finally got around to getting an e-book version of The RESP Book created and it is now available from the Kindle store on Amazon.com. Note that you can read a Kindle book on your computer – you don’t need an e-book reader. I’ve decided to have a special sale for my readers only and reduced the price to $4.99. This Sunday (or whenever I remember), I will be setting the price to the regular level of $9.99. I realize that most Canadians don’t have Kindles, so I will be looking into making the book available in other formats so that it can be read on iPads, Kobos etc. Amazon has made it very simple to upload a Kindle book which is why I started there. Unfortunately, some of the other e-book sellers make it harder to list an e-book with them. If you can spare a moment, I could use a review or two on the e-book Amazon page. Go to the RESP book page. While it’s true that you can read Kindle books on your PC or laptop it’s not good for your eyes. I have a Kindle and I can read for hours on it without hurting my eyes. That’s the point of having a Kindle. I was looking for your book for the Kobo (which I got for Christmas)… but since I couldn’t find it I decided to order a paper copy from Amazon. Should be getting it in a few days. Oh well! After reading your blog and the reviews for the book, I’m sure that I have spent my money wisely! Thank you! Congrats on the e-book launch! @Julie – Thanks for buying the book. Getting the ebook into the Kobo store is next on my list. I would be happy to share my experience with you – send me a note. I am a dual citizen, born US and living in Canada for 40 years. So, what does this have to do with RESPs. It is the nightmare that US citizens have to go through filing the US tax return if you own RESPs or TFSAs. The US does not recognize RESPs or TFSAs. As far as they are concerned they are foreign trusts and you have to file a 10page form declaring them and the income from them. Because they are trusts the (10 page) form 3520A has to be filed by March 15th to avoid penalties (up to 35% of the account per year). I am not sure how this is going to play out for me, but it is costing me too much just trying to get these forms filled out by a CPA. A US citizen can not renounce with out paying all back taxes. Back taxes include “unrealized” capital gain taxes on your home (if you own one) and can make renouncing citizenship financial impossibility. As someone who has always tried to take advantage of planning and saving for retirement and saving on Canadian taxes, this has been a rude awakening. I know I am not the only one caught like this. Kindle reader is also available in the iPhone app store…probably Android too. It’s easy to read (maybe not as good on the eyes as a Kindle / Kobo but better than a PC / laptop) and SO convenient—always right in your pocket! Can’t wait to read the book. Keep up the great blog! Been waiting for a kindle version as I have no space for more books. Also, at this price it’s a must buy for me. Thanks Mike! @Toronto Mom – Good to hear. @Simon – Thanks for the info. I have to say I’m not crazy about reading books on my iPhone. Any guess on a timeline for the iPad version? I have the Kindle Reader app, but rarely use it. Mike Your article discusses RESP eligibility. It doesn’t warn (I wouldn’t expect it to) of the inescapable US tax penalties for former US citizens (there is no “former” to the IRS) if you happen to own a RESP or TFSA. Long ago I left the US behind and became a Canadian. Unfortunately the IRS has me in its web and will not let me go. I imagine that there are other “US’ers” that are reading your newsletter that aren’t aware of the the snare. I wasn’t. With the TFSA I can not even close it and pay the taxes. I will be fined for not declaring it a foreign trust. Mike, congrats on your Kindle book. I shouldn’t have gotten carried away here. Can you have the same sale for the Kobo version when you release it there? Thanks! I have downloaded the kindle previewer for PC but when I go to purchase the book from Amazon it asks me to register a new kindle with serial number (since I don’t have a kindle) in order to complete the purchase, for delivery of the book. Can someone tell me how to work around that? Thanks in advance. @Chris – I have no idea. It depends on how much time I have and how easy/hard it is to get the book listed with Apple or whoever sells books for iPads. @Mike – I’d love to do the same sale for the different formats, but I can’t promise anything. Kindle is very easy to change the price which makes it easy to do a temporary sale. Hopefully the others are too, but I don’t know for sure. @Beth – I just tried setting up a new account. It looks like you have to select register a free Kindle reading app first. This does not mean registering a Kindle. At the page where it says “Beth, we did not find a Kindle device or reading app registered….” – select “Get Kindle for PC” and download the app. After that you should be able to buy a Kindle book. I’ll have to change my article since the info I gave is incorrect. It’s only valid if you have the actual book file. Mike – check out and play around with http://www.calibre-ebook.com free software that convert e-books among formats. It has its limitations and you will want to audit the “translation” but it might be good enough. I found it struggled with images. Send me a note and I can share my experience with you over the phone about creating an epub file. BTW epub can be read by virtually all other readers except the Kindle. @Frank – Thanks for that link. I actually have an epub file which I’m hoping will be good enough. I also have an Adobe pdf with DRM which I have no idea what I will do with. I hired someone to do the conversions. Now I just have to spend the time to get the books at the various e-book stores.